Sweaters and accessories from two points of view. Woodland gothic : 8 knitted pieces inspired by gothic architecture, enhanced by a mystical forest setting. Art house : 8 knitted pieces with a modern aesthetic, inspired by sculpture and graphic art. With circular needle and MC, cast on 147(147-151-151-155) sts. Do not join. Work in ribbing same as back for 1 row, end on rs. Cast on 4 sts at beg of next ws row, 4 sts at beg of the next 8 ws rows, then 3 sts at beg of the next 2 ws rows, end on rs – 189(189-193-193-197) sts. Bind off 3 sts at beg of the next 14 ws rows. At the same time, when piece measures 4” from beg, bind off 13(13-13-13-14) sts at beg of the next 7(7-3-3-10) rs rows, then 14(14-14-14-15) sts at beg of the next 4(4-8-8-1) rs rows. Sew raglan sleeve caps to raglan armholes. Sew side and sleeve seams. Measure in 5½” from straight side edge on bound-off edge of collar and place marker. Place a second marker 4½” in from first. 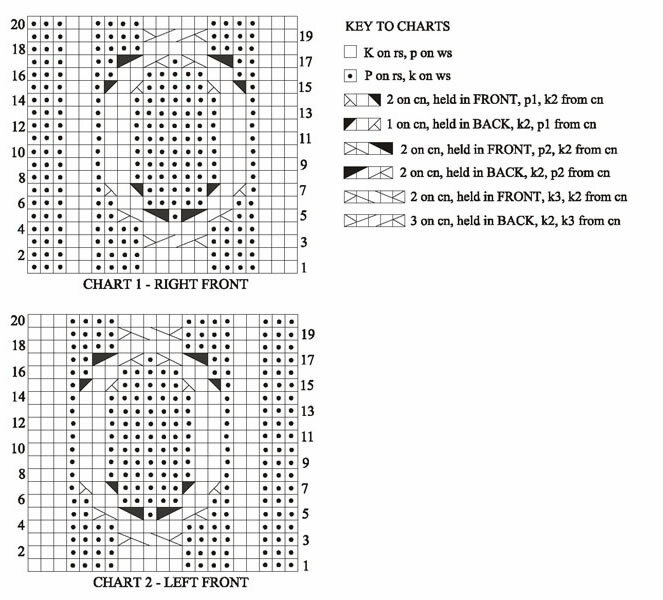 Sew cast off edge of collar to back and fronts as indicated on schematic. With circular needle, cast on 132 sts. Join, being careful not to twist sts. Mark for beg of rnd and carry marker up. Work even in pat st for 5½”, end on Rnd 2. Dec rnd – *k2tog, rep from * around – 66 sts. Beg with Rnd 2, work even in pat st until piece measures 7” from beg, end on Rnd 2. Rep dec rnd once more – 33 sts. Beg with rnd 2, work even in pat st until piece measures 8” from beg, end on Rnd 2. Next rnd: * k2 tog, rep from * around, end k1 – 17 sts. Rep the last rnd once more – 9 sts. Break off yarn leaving a long end for sewing. Thread end into tapestry needle and draw through all sts on needle. Pull up tightly and secure. Edging: With dpn’s, cast on 4 sts and work I-Cord as follows: row 1 (rs) - * k4, do not turn work. Slide sts to beg of needle to work next row from rs. Rep from * until cord reaches around lower edge of hat and to fit your head. Fasten off. Sew ends of I-Cord tog. Sew around lower edge of hat. 17 - SSK, p6, k7, p6, k1TBL, yo, k2, yo, k1TBL, p6, k7, p6, k2 tog. 75 - SSK, p2, k1TBL, p2, k3, p2, M1k, k2, M1k, p2, k3, p2, k1TBL, p2, k2tog. 97 - SSK, k1TBL, p2, k1TBL, p1, yo, k2, yo, p1 k1TBL, p2, k1TBL, k2 tog – 16 sts. 99 - SSK, p2, k1TBL, p2, M1k, k2, M1k, p2, k1TBL, p2, k2tog – 16 sts. 101 - SSK, p1, k1TBL, p2, k1TBL, yo, k2, yo, k1TBL, p2, k1TBL,p1, k2 tog – 16 sts. 102 -Rep Row 2. Rep Rows 99-102 until piece measures length indicated in directions. With smaller straight needles, cast on 114(122-134-146-158-170) sts. Establish Leaf Pat: 1 (rs) — (k2, p2) 4(4-5-6-7-8) times, k1, place marker, work row 1 of leaf pat over 34 sts, place marker, k1, p2, (k2, p2) 15(17-19-21-23-25) times. 2 – (k2, p2) 15(17-19-21-23-25) times, k2, p1, work row 2 of leaf pat to next marker, p1, (k2, p2) 4(4-5-6-7-8) times. Work even in pat as established until piece measures 1” from beg, end on rs. Change to large needles. With size 7 straight needles, cast on 52 sts. With smaller needles, cast on 54(58-66-70-78) sts. Work in ribbing same as back for 2”, end on rs. Change to larger needles and p the next row, dec 11(9-12-12-14) sts across – 43(49-54-58-64) sts. Work in st st for 2 rows, end on ws. Note: As you work the short rows, when piece measures 3” from beg, dec at beg of next rs row as k3, k2 tog, work to end. Rep this dec every 2¾” 4 times more. Short rows (rs): k3, wrap and turn, purl back. Next row (rs) – k6(6-7-7-8), wrap and turn, purl back. Continue short rows, knitting 3(3-4-4-5) sts more each row 6(11-4-8-5) times more, 2(2-3-3-4) sts more 7(2-7-3-3) times, 0(0-2-2-3) sts 0(0-2-2-3) times, then 0(0-0-0-2) sts 0(0-0-0-2) times, end on ws. Next row (rs): Knit across all sts. Continuing to work decs at beg of rows, work in st st for 5 rows more, end on ws. Shape neck (rs): Work to last 5 sts, k2 tog, k3. Rep this dec every rs row 14(14-12-8-10) times more, then every 4th row 9(10-12-15-14) times. When all side decs have been completed and piece measures 15” from beg, shape armhole same as left armhole on back. When all armhole and neck decs have been completed, work even on 7(7-9-12-14) sts until armhole measures 7½(8-8½-9-9)”, end on ws. Bind off. Work to correspond to left front, reversing all shaping. Work short rows on ws rows, purling instead of knitting. When working wrapped sts, p each wrapped st and its wrap tog. Work side decs at end of rs rows as ssk, k3. Work neck decs at beg of rs rows as k3, ssk. Shape armhole same as right armhole on back. Next row (ws) – work 37(38-42-45-49-53) sts, cast on 58(58-63-68-72-77) sts for left sleeve, p62(64-70-78-84-90), cast on 58(58-63-68-72-77) sts for right sleeve, place marker, work 37(38-42-45-49-53) sts – 252(256-280-304-326-350) sts. Working sts cast on for sleeves in Reverse st st and all other sts in pat as established, work even for 2 rows, end on ws. Keeping 21 sts at each front edge in cable pat as established and all other sts in st st, work even for 2 rows, end on ws. Dec row 1 (rs) – work 21 sts in cable pat, k14(10-13-8-17-5), k2 tog, * k10(10-8-7-6-6), k2 tog, rep from * 14(15-20-26-30-36) times more, k14(10-13-9-17-5), work to end – 236(239-258-276-294-312) sts. Work even in pat as established for 5 rows, end on ws. Dec row 2 (rs) – work 21 sts in cable pat, k13(9-12-7-16-4), k2 tog, * k9(9-7-6-5-5), k2 tog, rep from * 14(15-20-26-30-36) times more, k14(10-13-9-17-5), work to end – 220(222-236-248-262-274) sts. Work even for 5 rows, end on ws. Dec row 3 (rs) – work 21 sts in cable pat, k13(9-1-7-16-4), k2 tog, * k8(8-7-5-4-4), k2 tog, rep from * 14(15-20-26-30-36) times more, k13(9-2-8-16-4), work to end – 204(205-214-220-230-236) sts. Work even for 5 rows, end on ws. Dec row 4 – work 21 sts in cable pat, k12(8-1-10-15-3), k2 tog, * k7(7-6-4-3-3), k2 tog, rep from * 14(15-19-25-30-36) times more, k13(9-1-10-16-4), work to end – 188(188-194-194-198-198) sts. Work even until sleeves measure 5(5-5½-5½-6-6)” above cast-on edge, end on ws. Row 1 (rs) – p21, decreasing 4 sts across, drop marker, p to last 21 sts, decreasing 25 sts across, drop marker, p 21, decreasing 4 sts across – 155(155-161-161-165-165) sts. Next row (ws) – knit. Length should read: 18(20-22)" (Not including straps). 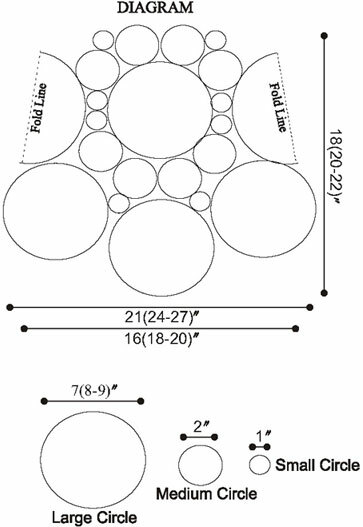 Gauge: Large Circle - 7(8-9)" across. Medium Circle - 2" across. Small Circle - 1" across. note: due to the nature of this pat, the number of sts will vary from row to row. 1 (ws) – p2, (k1, yo, k1) all in next st, p1, * p1, k1, p2, (k1, yo, k1) all in next st, p1, rep from * to last 4 sts, end p1, k1, p2. 2 – k2, p1,k1, * p5, k1, p1, k1, rep from * to last 6 sts, end p5, k1. 3 – p2, p3 tog, p1, * p1, k1, p2, p3 tog, p1, * rep from * to last 4 sts, end p1, k1, p2. 4 – k3, LT2, * k1, RT2, k1, LT2, rep from * to last 3 sts, end k3. 5 – p2, k1, p1, * p1, (k1, yo, k1) all in next st, p2, k1, p1, rep from * to last 4 sts, end p1, (k1, yo, k1) all in next st, end p2. 6 – k1, p5, * k1, p1, k1, p5, rep from * to last 4 sts, end k1, p1, k2. 7 – p2, k1, p1, * p1, p3 tog, p2, k1, p1, rep from * to last 6 sts, end p1, p3 tog, p2. 8 – k3, RT2, * k1, LT2, k1, RT2, rep from * to last 3 sts, end k3. With smaller straight needles, cast on 78(90-102-114-126- 138) sts. Ribbing: 1 (rs) – k2, * p2, k2, rep from * across. 2 – p2, * k2, p2, rep from * across. Rep these 2 rows until piece measures 3½” from beg, end on ws. Change to larger straight needles. Inc row (rs) - work 3(0-7-4-0-8) sts in ribbing as established, place marker, k to last 3(0-7-4-0-8) sts, increasing 41(45-47-51-53-57) sts across, place marker, work in ribbing as established to end – 119(135-149-165- 179-195) sts. Establish chart: Row 1 (ws) – work in ribbing as established to first marker, work row 1 of chart to next marker, work in ribbing as established to end. With smaller straight needles, cast on 54 sts. Work in ribbing same as back for 3½”, end on ws. Change to larger straight needles. 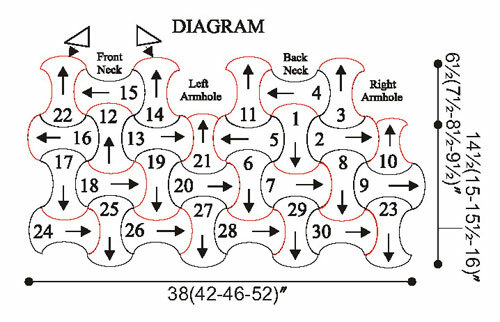 Inc row (rs): work 0(0-3-7-0-3) sts in ribbing as established, place marker, k to last 0(0-3-7-0- 3) sts, increasing 37(37-43-51-59-65) sts, place marker, work in ribbing as established to end – 91(91-97-105- 113-119) sts. 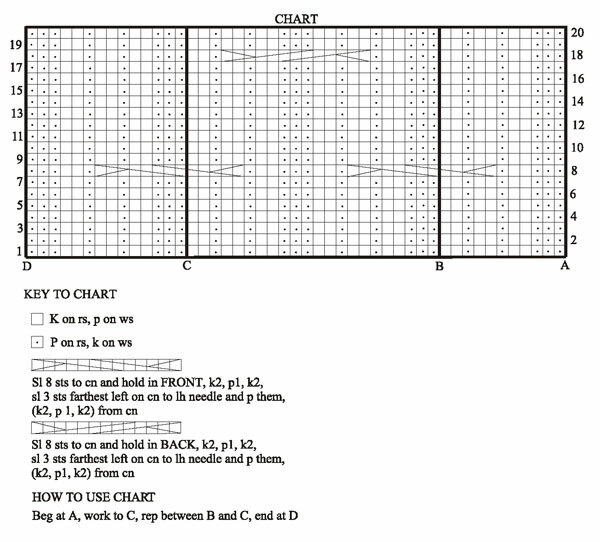 Establish chart: row 1 (ws) – work in ribbing as established to first marker, work row 1 of chart to last marker, work in ribbing as established to end. Sleeves: Work even in 2/2 rib for 4½”, end on rs. Change to larger needles.